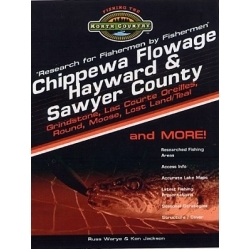 The names Chippewa Flowage and Hayward names remain two of the most identifiable places in Wisconsin - both yesterday and today. Anchored by the island-studded Chippewa Flowage, Sawyer County and the community of Hayward epitomizes North Country landscapes with northern forests, pristine rivers, flowages and the all-important natural lakes that have attracted visitors since the late 1880's. Today as well as yesterday fishing and the concept of retreating to quiet northern waters has attracted anglers to the region from all over the nation. Additionally, Hayward is home of the Freshwater Fishing Hall of Fame, an organization devoted to preserving freshwater fishing history as well as record keeping. The diversity of waters - rivers, flowages, glacial lakes of various sizes, and small wilderness potholes - are immense in Sawyer County. It begins with the sprawling Chippewa Flowage and the important Chippewa River drainage system, including the East and West Forks of the famous river. Not to be overlooked are other lakes of renown - Grindstone, Lac Courte Oreilles, Round, Moose, Lost Land, Teal, Sand, Spider Lake Chain, Winter, Whitefish, among many others. These waters offer superb fishery resources that vary from walleye to smallmouth bass, muskie to panfish. For those that want to explore and get away from the mainstream there are dozens of smaller - and out of the way - lakes and glacial potholes, even smaller flowages, waiting personal discovery. Some of them are truly excellent resources, as the book reveals, while others offer only modest fisheries, although wilderness aesthetics remain outstanding. 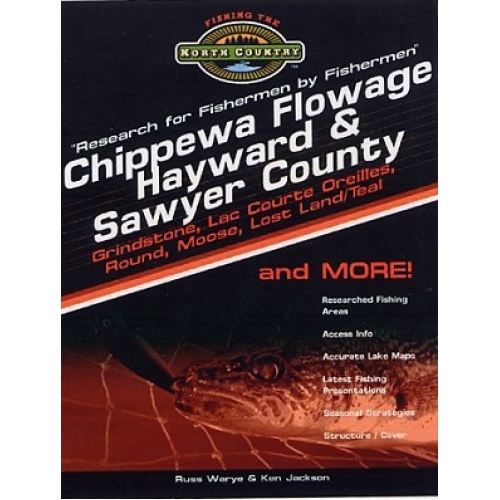 Some of the lakes included in this book are: Ashegon, Barber, Barker, Beaver Lake (T41N, R6W, S27), Black, Black Dan, Blaisdell, Blueberry, Blue Gill, Burns Lake (Tiger Cat Flowage), Callahan, Chetac, Chippewa Flowage, Christner, Connors, Clear Lake (Spider Lake Chain), Deer, Durphee, Fawn Lake (Spider Lake Chain), Fishtrap, Ghost, Glover, Grindstone, Gurno, Hadley, Hayward, Helane, Heron, Holly Lake (Upper Holly), Holly Lake (Lower Holly), Hunter, Indian, Island Lake (T39N, R5W, S2), Knuteson, Lac Courte Oreilles, Lake of the Pines, Little Lac Courte Oreilles, Little Round Lake, Little Sand Lake, Little Sissabagama Lake, Little Spider Lake (Spider Lake Chaini), Loreta Lake (Brunett Flowage), Lost Land Lake, Lower Clam, McClaine Lake (Tiger Cat Flowage), Meadow, Moose, Mud Lake (T38N, R9W, S17), Mud Lake (T41N, R7W, S33), Nelson, North Lake (Spider Lake Chain) Pacwawong, Partridge Crop, Pelican, Phipps Flowaage, Phipps Spring, Placid Lake (Tiger Lake Flowage), Radisson Flowage, Red Ike Lake, Reed, Round, Sand, Sissabagama, Smith, Spider Lake Chain (including namesake Spider Lake), Spring Lake (T40N, R9W, S12) Squaw (Osprey) Lake, Summit, Teal, Teal River Flowage, Tiger Cat Flowage, Totagatic Flowage, Twenty-Seven, Two Boys, Upper Twin Lake (Tiger Cat Flowage), Whitefish, Wilson, Windfall, Windigo, and Winter lakes. Book No. 8 contains approximately 200 pages of great information and details about each body of water along with many marked fishing areas for each lake.